UPDATE: Pink ATGs and Refills are ON THEIR WAY! Just a quick note...due to a manufacturer's delay, the long-anticipated arrival of the pink ATGs and their lovely refills is SOON upon us. They arrived at our distributor's warehouse on July 28 and are being processed and shipped on Monday, August 2. We expect delivery and then immediate shipment shortly thereafter. If you've pre-ordered yours, an email will be sent to you soon regarding payment and shipping details. The really good news? We may have a couple ATGs and refill packages available, but they will go on a first-come, first-served basis. Please contact Shannon at info@papermadebakery.com to place your order. Thanks to all of our FABulous customers for their patience and support. I know you're just as anxious to receive these babies as I am! Be sure and send me a note if you have any questions. It's sure been fun being able to enjoy some real time off from work -- the office, housework, yard work, etc. I've gotten the chance to read a couple good books and even create an album I picked up on my last adventure to the Redlands area at Collective Journey. The album was designed by Traci Goshen and uses Cosmo Cricket's "Garden Variety" line. It's sooo cute! It felt good being able to break out the old tools to make something for me instead of putting on my creative thinking cap to design my own kit projects. While I love doing that, I especially enjoyed taking this time today to create for myself. What do you think of this? Take a few minutes tomorrow and spend it being creative -- you'll really be glad you did! 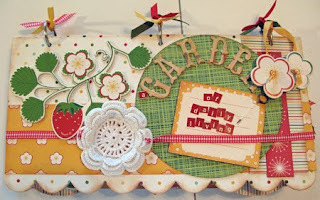 Everyone loves to give and receive handmade cards. 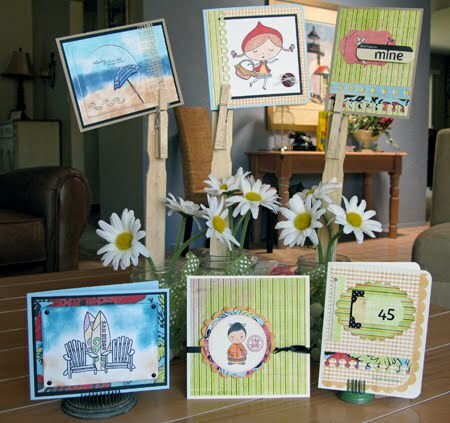 You probably have a nice stash of them because making cards is a fun, creative quick-fix for us scrappy folks. Have you checked your stash lately? Is it a little low? Do you want to try out some great new techniques? Join us on Monday, July 26 at 5:30 where we'll make a half dozen all-occasion greeting cards. We'll use dozen of techniques, many which may be brand new to you! Several are inspired by summer and the beach, others are whimsical and fun-loving -- all of them use a variety of techniques that make them unique. This new batch of cards can be given to the guys and gals in your life. If you'd like to join the fun, email us at info@papermadebakery.com to reserve your spot. 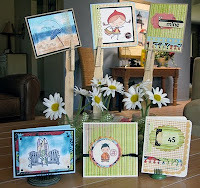 The class, which includes all the materials for the six cards and envelopes, is only $25. You'll need to bring your basic tool kit and adhesives (including tape runner, wet adhesive and foam dots/squares). Can't wait to get crafty with you! Today I finished my hostess gifts to take to the 4th of July BBQ and swim party we're attending this afternoon. My mom is, as you are all aware, the Hostess with the Most-ess and deserves all kudos and goodies possible. I borrowed this idea from another fave blog, Mish Mash, using the new PTI Friendship Jar stamp sets and matching dies designed by Michelle Wooderson. They are just so quaint, vintage-inspired and very fun to work with. 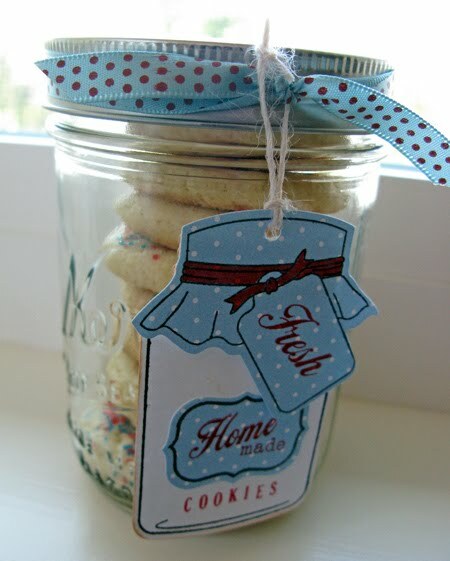 Mish's daughter created similar jars filled with red, white and blue sugar cookies and they looked so Americana I just had to recreate them. Besides the stamps and coordinating dies, I also got to use my Copic markers and an old Karen Foster "interlocking" alpha set. I made four jars in total and will share another couple with my girlfriends, Anne and Stephanie, when we hook up later this week in Squaw Valley/Lake Tahoe. They also qualify as awesome hostesses. So, if you're in need of an easy, fun and feel-good hostess gift, remember to make a friendship jar! Off to the celebrations -- have a safe and happy Fourth of July! If you're not a Twilight fan then you won't be impressed with this tale, so skip down to the awesome find bit of the story...but don't blame me if you're left to wonder just what kind of luck I have. Maria, who works in the Brass Plum department at our local Nordstrom is one cool chickie! She helped me get the Camp Jacob t-shirt I wanted (among other very nice clothing articles) plus the TWO tickets to the PRE-premiere of "Twilight Saga: Eclipse" on Tuesday night at 9:00 p.m. Yep, that's three hours BEFORE the world premiere! Because I'm such a nice sister (see post below about the Mother's Day mini album) I invited my little sis to be my guest. After assessing the loooong snake-like line outside the theater entrance, we decided to get a bite to eat anyway. When we smooshed ourselves into said line about 30 minutes later who should we find directly in front of us but Craft Diva, Danielle Forsgren, of the Diva Craft Lounge online radio show! I've worked with Danielle over the years with charity events, and we're craft buddies as well, so it was a boon to run into her at this event, too. We whiled away the hours before the movie began and we all LOVED the film! 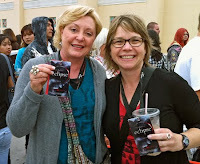 The experience was outstanding and I highly recommend seeing Eclipse. So, whose side are you on -- Team Edward or Team Jacob? Here's the Awesome Find part...today is my first official day of summer vacation! Yipppeee! I decided to devote it to running errands and cleaning house, that way I can "skip and play" (as my mother would say) and not think about chores for a while. One of the errands I ran was to one of our local thrift shops to make a donation. As I dropped off the two big bags of clothing I noticed this black wire rack pushed into the corner. When I asked if that was for sale, the reply was something about it not being priced, etc. I asked if I could come back in a couple hours and see how much it would be tagged for. The lady was kind enough to stop what she was doing and assess the wire rack. I took a closer look myself to make sure it was what I thought it was...and she announced it would cost $20. I'm not sure if I looked funny or something, but she then announced that today was "half off day" and it would only cost $10. I managed to say "I'll take it!" and let all the gears in my head catch up. I'd bought myself a sturdy wire 12 x 12 paper display by Novelcraft with 30 slots/shelves! I considered this quite a fortuitous moment and happily tossed it into the back of the pick-up and whistled all the way home.